You will never get a new industrial sewing machine for under $400. But you can get some good machines that can sew denim for under $400. Here is 7 of them. First of all, let me tell you one thing. If you are looking for a factory like machine to sew denim for under $400, you will be disappointed. 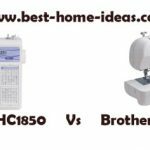 If your job is just to do some hemming or alterations, any medium range home sewing machine should get the job done for you. If you are really into heavy duty denim projects, you will be better of buying an industrial sewing machine. Which is the best sewing machine for denim ? Before answering this question, first let me warn you about the low cost heavy duty machines you get in the market. I have come across many so called ‘Heavy Duty Denim Machines’ that cost well under $150. To be honest, such machines are no better than low cost, plastic machines. To sew denim, you need a sewing machine with a powerful motor, heavy-duty construction, a leveling button on general purpose foot and walking foot in combination with the right needle and the right thread. All expensive sewing machines are not good with denim, so you must be picky. There is no connection between the price and the ability of a machine to sew denim. In my experience, I have seen that Janome makes the best sewing machines that suits denim. I am not saying that there are no other brands better than Janome. Brother and Singer also have some quality machines that can sew denim. 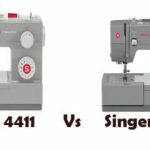 Here I am talking about sewing machines that cost under $400 only, if you are ready to go into the thousands (dollars) you can find better machines from Juki, Bernina, Viking, Pfaff and others. Now let us have a look at the list of 7 best sewing machines for denim, which can be bought in U.S for under $400. Literally the very best sewing machine for denim. Denim is like butter for this machine. However, some may dislike this machine as it is not a computerized one. HD3000 is a mechanical sewing machine with 18 built-in stitches, automatic needle threader and one-step buttonhole. Its heavy-duty construction makes it the best machine for denim sewing. It is one of the heaviest machine around. It weighs around 23.8 pounds, which denotes the quality of metal used for construction. 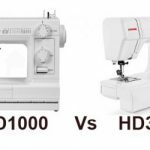 You need sturdy machines to sew denim, and HD3000 is one of that kind. It really is one of my favorite denim machine. You don’t need to worry about the durability factor at all. Cons : There are only 18 built-in stitches on this machine. Being a mechanical sewing machine, it might not appeal to all. Another machine designed for heavy duty fabrics. This one will be a better option for those who consider HD3000 as expensive. HD1000 is slightly inferior in features, when compared to HD3000. 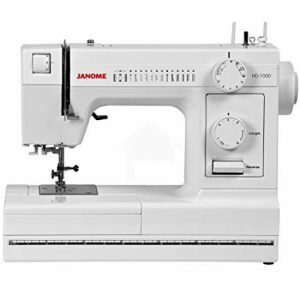 It comes with 14 built-in stitches, automatic needle threader and one-step buttonhole. This machine is as good as HD3000 when it comes to denim. Almost all parts, except some exterior parts are made of metal. Cons : Again, this one also is a mechanical sewing machine. As far as beginners are concerned, it lacks a drop-in bobbin and 1-step buttonhole, which might affect the ease of use. HD3000 will be a better option in that case. This is the one for those who love computerized sewing machines. This one costs the same as HD3000. It has 30 built-in stitches, automatic needle threader, speed control slider, start/stop button, one-step buttonhole etc. 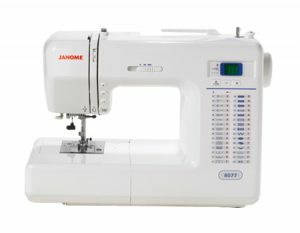 Janome 8077 is the best computerized sewing machine for denim. Even though this machine has a strong motor, it doesn’t make a lot of noise. The feed system of this machine is exceptional. It never stalls. User feedback for this machine is also great. Cons : The user manual requires some imrpovement. 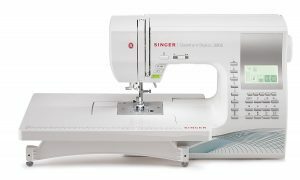 This is the most expensive sewing machine in this list. PC420 PRW is a feature packed sewing machine. It is a computerized sewing machine with lot of advanced features like custom stitch, automatic thread cutter etc. 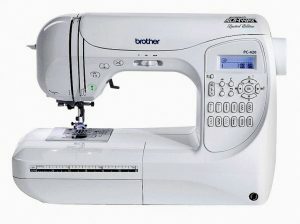 It has 294 built-in stitches, automatic needle threader, start/stop button, speed control slider, 10 one-step buttonholes etc. It sews all kinds of fabrics with exceptional quality, not just denim. That is the reason why it features in our list of ‘Machines You Can Buy With Your Eyes Shut’. Cons : The price is on the higher side. 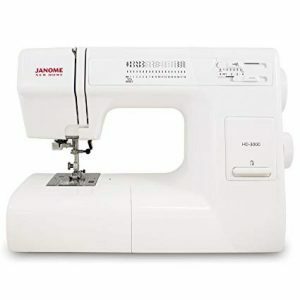 This is another sewing machine that has exceptional stitch quality. It works equally well on all kind of fabrics including denim. Singer 9960 is literally feature rich. As far as the features are concerned, there is no real competition to this machine. 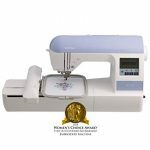 It packs a whopping 600 built-in stitches along with an automatic needle threader, automatic thread cutter, 13 one-step buttonholes, stitch elongation and mirror imaging etc. Electronic Auto Pilot option is also present. The selling point of this machine is its price. You won’t get a better computerized machine for the price. It also features in our list of ‘Machines You Can Buy With Your Eyes Shut’. You are rest assured of its quality. Cons : Nothing much, except that the older machines had a bobbin jamming issue, which was resolved with a product upgrade. All 5 sewing machines we discussed earlier costs around $300 or above. 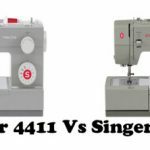 If your budget doesn’t permit you to go that far, you can consider two inexpensive, but good machines namely Brother XR9500PRW and Singer 7258. These two machines are not overly expensive and are very good home sewing machines. These two machines are good for basic denim hemming and stuffs. Consider these two machines only if price is a real constraint for you. These are not denim special sewing machines by any stretch of imagination. 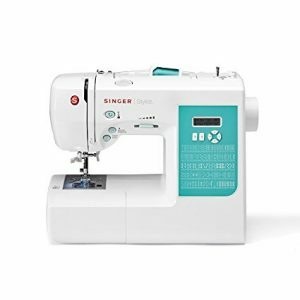 This has been voted as the best sewing machine for the money under $200. 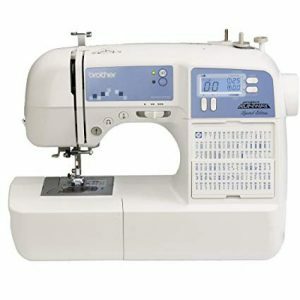 It has 100 built-in stitches, automatic needle threader, 8 one-step buttonholes etc. This machine won the Women’s Choice Award for the best home sewing machine in America for the year 2013. It is an excellent sewing machine with 100 built-in stitches, automatic needle threader, 6 one-step buttonholes etc. I am sure that, your confusion is not over yet. So I will make it simple for you. These are my personal recommendations. You are the one to decide which one is the best for you, I just tried to guide you. Hope it helps.